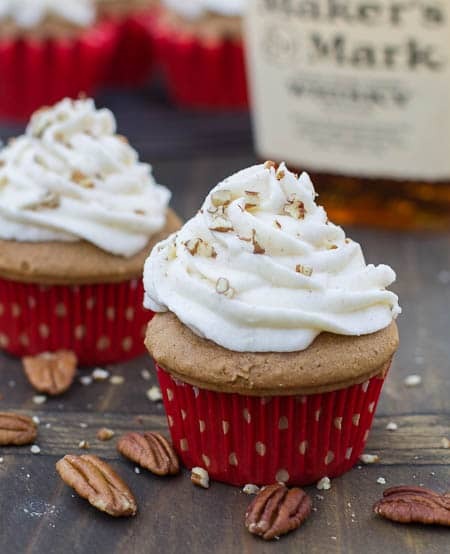 Quick and easy Bourbon and Spice Cupcakes will be a hit at your next tailgating event or holiday party. 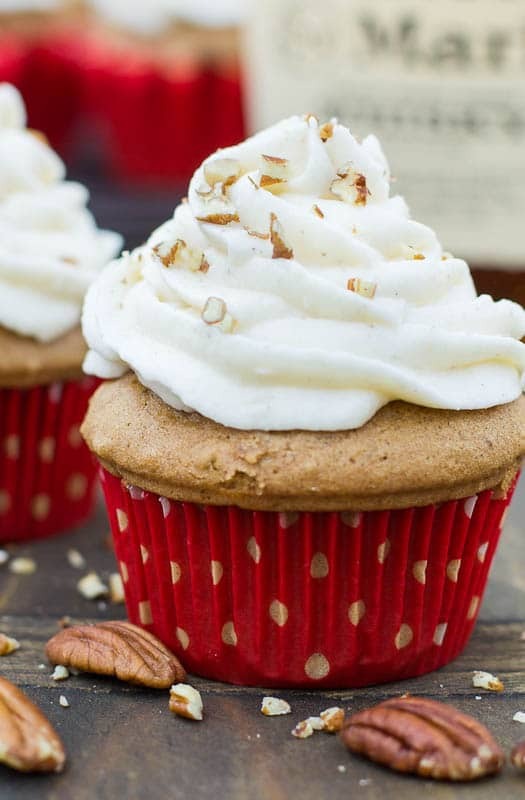 With a splash of bourbon in the batter and in the frosting, these are adult-only cupcakes. The frosting is a rich combination of mascarpone cheese, butter, and cream cheese flavored with cinnamon, nutmeg, and bourbon. It is one of the most delicious frostings ever! Bourbon is one of the most versatile liquors to cook with. It adds great flavor to everything from baked beans to chili to pecan pie. Do you cook or bake with liquors? Which is your favorite to use? 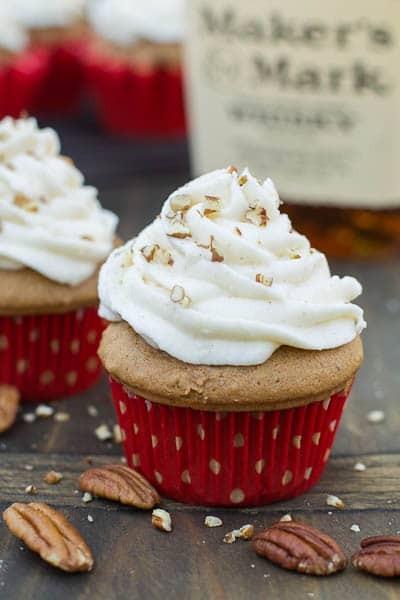 Easy to make Bourbon Spice Cupcakes with a delicious mascarpone cheese frosting. Prepare the spice cake mix according to directions on box, adding pecans and 2 tablespoons bourbon to the batter. Divide batter between muffin cups and bake according to box directions. Cool completely. Using an electric mixer, beat butter, cream cheese, and mascarpone cheese on medium speed until smooth. Add powdered sugar 1/4 cup at a time, beating until smooth. Beat in bourbon, cinnamon, and nutmeg. Pipe or spread frosting onto cupcakes. Garnish with chopped pecans if desired. This recipe makes a lot of frosting, but if you really pile on the frosting like I did it will only frost 12 cupcakes. Double recipe for 24. This entry was posted in Cakes, Desserts and tagged bourbon, cupcakes, southern desserts. Bookmark the permalink. These were delicious! I round that the frosting was more than enough for 2 dozen cupcakes, but I also had to add 1 cup more sugar than you suggest to the frosting, or it tasted too buttery. In the end, these were a huge hit for my boyfriend’s birthday! Oh my gosh these are so cute! I love the flavour combo it sounds delicious! These sound amazing! That frosting looks so rich and creamy — the combination of mascarpone and cream cheese with spices really sounds delicious. 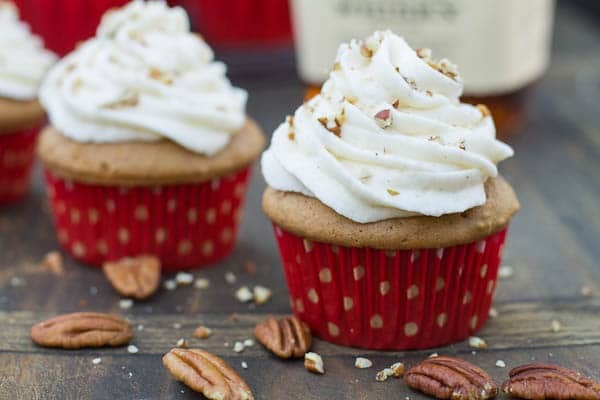 A boozy cupcake sounds like a nice change of pace! Whoa baby, these look so good! 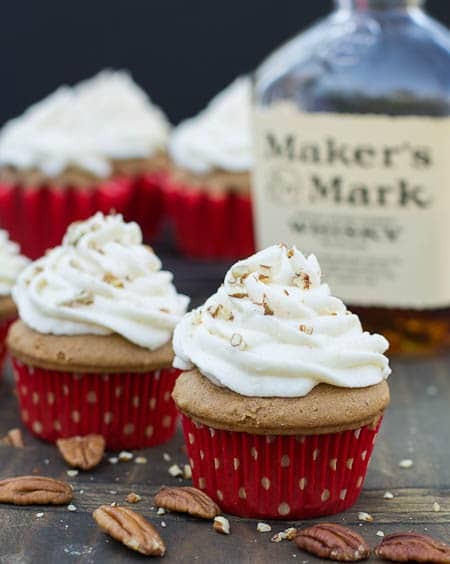 My father-in-law would go nuts for these – he’s a huge bourbon fan to say the least : ) I love that you used mascarpone in the frosting too! Just thinking about the flavor combination makes me swoon. They look beautiful. 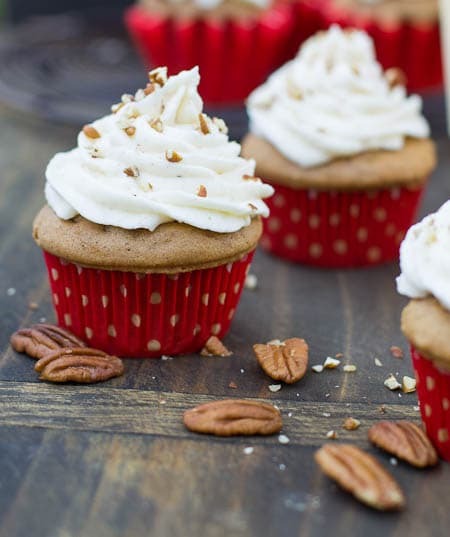 I love spiced cupcakes so I am wishing I had a couple of these cupcakes in front of me right now, yum! Holy cow these sound incredible! Christin, what beautiful cupcakes. And they look amazingly delicious! Pinned! 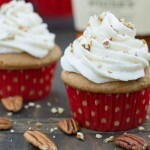 I am definitely down with some Bourbon cupcakes! These look delicious Christin! I love the pecans and marscapone in the frosting too! – Double yum!